All organisations that process personal data are required to comply with data protection legislation. This includes in particular the Data Protection Act 1998 (or its successor) and the EU General Data Protection Regulation (together the ‘Data Protection Laws’). The Data Protection Laws give individuals certain rights over their personal data whilst imposing certain obligations on the organisations that process their data. This policy sets out the Company’s procedures for implementing the Data Protection Laws. It should be read in conjunction with the REC’s model Data Protection Policy. * For the purposes of this policy we use the term ‘personal data’ to include ‘sensitive personal data’ except where we need to refer to sensitive personal data specifically. DBS processing, Worker Profiles, Registration, Audit purposes, Payroll processing. Only those listed in the Appendix are permitted to add, amend or delete personal data from the Company’s database(s) (‘database’ includes paper records or records stored electronically). All Company staff are responsible for notifying those listed in the Appendix where information is known to be old, inaccurate or out of date or a request for erasure, access, rectification or restriction of processing has been received from the individual. Company staff are also responsible for notifying those listed in the Appendix where any request for data portability, objection to processing or where consent to process has been withdrawn and has been received from the individual. The incorrect processing of personal data e.g. sending an individual’s details to the wrong person, allowing unauthorised persons access to personal data, sending information out for purposes for which the individual did not give their consent, or not having a lawful reason to process personal data, may give rise to a breach of contract and/or negligence leading to a claim against the Company for damages from an employee, work-seeker or client contact. Staff should lock their computer screens when they are not in use. All devices, whether company or personal devices (including but not limited to computers, mobile phones, other hand-held devices) containing personal data relating to the services of the Company shall be encrypted and password protected and should be processed through the Company’s CRM and Planday secure cloud based system. Staff should not disclose their passwords to anyone. Email should be used with care. Company staff must ensure that emails are sent only to the intended recipient/s. Where Company staff send an email in error then the email must be recalled immediately and Company staff must inform those listed in the Appendix of the error so that any risk of a personal data breach can be limited. Personnel files (whether for internal staff or work-seekers) and other personal data should be stored securely to prevent unauthorised access. They should not be removed from their usual place of storage without good reason. Personnel files (whether for internal staff or work-seekers) should always be locked away when not in use and when in use should not be left unattended. Personal data should only be stored for the periods set out in the Company’s data retention policy. Processing includes the destruction or disposal of personal data. Therefore staff should take care to destroy or dispose of personal data safely and securely. Such material should be shredded or stored as confidential waste awaiting safe destruction. The right to withdraw consent where it was relied upon to process their personal data. the Company has not collected/processed the data from the individual directly. Where personal data has been collected from the individual the privacy notice will need to be issued at the point the data is collected. Where the Company intends to further process the personal data for a purpose other than that for which the personal data was collected, the Company shall provide the individual, prior to that further processing, with information on that other purpose and with any relevant further information in an updated privacy notice. Where personal data has not been obtained from the individual, the Company shall provide the privacy notice within a reasonable period after obtaining the personal data, but at the latest within one month, having regard to the specific circumstances in which the personal data are processed. If the personal data are to be used to communicate with the individual then the privacy notice will be issued at the time of the first communication with the individual. If a disclosure to another recipient is envisaged, then the privacy notice will be issued to the individual at the latest when the personal data are first disclosed. Company staff will be responsible for issuing privacy notices to individuals whose personal data is processed by the Company in the timeframes and circumstances mentioned above. Recipients or categories of recipients of personal data. Individuals are entitled to obtain access to their personal data on request, free of charge except in certain circumstances. The existence of automated decision-making, including profiling, based on a public interest or a legitimate interest and, at least in those cases, meaningful information about the logic involved, as well as the significance and the envisaged consequences of such processing for the individual. If the Company transfers the individual’s personal data to a third country or to an international organisation, the individual shall have the right to be informed of the appropriate safeguards in place relating to the transfer. If the Company processes a large quantity of information concerning the individual making the request, the Company might request that the individual specify the information or processing activities to which the request relates to specifically before the information is delivered. If such a request is required by the Company then it shall be delivered promptly to the individual, taking into consideration the timeframes that subject access requests must be completed. The individual’s right to access their information shall not adversely affect the rights and freedoms of others and they will not be able to access the personal data of third parties without the explicit consent of that third party or if it is reasonable in all the circumstances to comply with the request without that third party’s consent, taking into consideration any means to redact the personal data of any third party. Persons listed in the Appendix will decide whether it is appropriate to disclose the information to the individual on a case by case basis. This decision will involve balancing the individual’s right of access of their personal data against the third party’s rights in respect of their own personal data. An individual, or another data controller acting on an individual’s behalf, has the right to obtain from the Company rectification of inaccurate or incomplete personal data concerning him or her. The Company must act on this request without undue delay. Taking into account the purposes of the processing, the individual shall have the right to have incomplete personal data completed, including by means of providing a supplementary statement stating what they would require to be completed. The Company shall communicate any rectification of personal data to each recipient to whom the personal data have been disclosed, unless this proves impossible or involves disproportionate effort. The Company shall inform the individual about those recipients if he or she requests it. Where the Company, acting as a data processor, receives information from a data controller to rectify an individual’s personal data, then the Company shall comply with this request unless this proves impossible or involves disproportionate effort. In circumstances where the Company is unable to comply with the request as it proves impossible or involves disproportionate effort, the Company will document this in a privacy impact assessment or similar. The personal data have been collected in relation to the offer of information society services to a child. Where the Company, acting as data controller, has made the personal data public and is obliged to erase that personal data, the Company, taking into account available technology and the cost of implementation, shall take reasonable steps, including technological measures, to inform data controllers which are processing the personal data that an individual has requested the erasure by such controllers of any links to, or copy or replication of, those personal data. The Company shall communicate any erasure of personal data to each recipient to whom the personal data have been disclosed, unless this proves impossible or involves disproportionate effort. The Company shall inform the individual about those recipients if an individual requests it. Where the Company, acting as a data processor, receives information from a data controller to erase an individual’s personal data the Company shall comply with this request, unless this proves impossible or involves disproportionate effort. Where processing has been restricted, such personal data shall, with the exception of storage, only be processed with the individual’s consent or for the establishment, exercise or defence of legal claims or for the protection of the rights of another natural or legal person or for reasons of important public interest. Where an individual who has successfully asked for their personal data to be restricted, then the Company will inform the individual before such a restriction is lifted. The Company shall communicate any restriction of processing to each recipient to whom the personal data have been disclosed, unless this proves impossible or involves disproportionate effort. The Company shall inform the individual about those recipients if he or she requests it. Where the Company, acting as a data processor, receives information from a data controller to restrict processing an individual’s personal data, the Company shall comply with this request, unless this proves impossible or involves disproportionate effort. Company staff will advise those listed in the Appendix when they receive a request to port data. Those listed in the Appendix will be responsible for identifying if the above circumstances are satisfied for the purposes of porting the data to the individual and/or another data controller. For the avoidance of doubt, there is no obligation to port personal data that is not kept by automated means by the Company. An individual, has the right to object to their personal data being processed or profiled based on a public interest or a legitimate interest. Where the Company receives an objection to processing or profiling on the above, those listed in the Appendix will ensure that the processing and/or profiling ceases unless such persons can establish compelling grounds to continue to process the personal data. If this is the case those persons listed in the Appendix will document this in a privacy impact assessment or similar. An individual has the right not to be subjected to an automated decision making process, including profiling, that produces a legal effect or a similarly significant effect on the individual. Where a) and c) apply the Company will ensure that suitable measures are in place to safeguard the individual’s rights and freedoms and legitimate interests, under both Data Protection Laws and the Human Rights Act 1998, before this type of processing occurs for personal data. Where a) to c) apply the Company will only process sensitive personal data where the Company has received either the explicit consent to do so or there is a substantial public interest to do so. Again the Company will ensure that suitable measures are in place to safeguard the individual’s rights and freedoms and legitimate interests, under both Data Protection Laws and the Human Rights Act 1998, before this type of processing occurs for sensitive personal data. Company staff will be responsible for implementing the above safeguarding measures. Where the Company relies on an individual’s consent to process their personal data then the Company will advise the individual that they have the right to withdraw his or her consent at any time. Any Company staff who receives a request from an individual to withdraw their consent to processing their data will be responsible for issuing the individual with the Company’s withdrawal of consent form. Once the form has been completed it should be given to the persons listed in the Appendix to process the individual’s request further. The Company shall provide information on action taken or not taken with regards to the individual data protection rights, set out in paragraphs 1 to 9 inclusive, without undue delay and in any event within one month of receipt of the request. Where the Company does take action, then it may, where necessary, extend this period by a further two months, taking into account the complexity and number of the requests. Those persons listed in the Appendix shall inform an individual of any extension within one month of receipt of the request, together with the reasons for the delay. Where the Company does not take action on the request of the individual then those persons listed in the Appendix will inform him or her on the possibility of lodging a complaint with the ICO and seeking a judicial remedy. The Company must demonstrate whether the request is manifestly unfounded or excessive. Those listed in the Appendix will be responsible for demonstrating this. Where the individual makes the request by electronic means the Company shall provide the information in a commonly used electronic form, unless otherwise requested by the individual. The Company will need to act on any personal data protection breach it suspects or knows of when acting as either a data controller or a data processor. Company staff must inform those persons listed in the Appendix where a personal data breach has either been reported to him or her or they themselves have identified a personal data breach. Unless the personal data breach is unlikely to result in a risk to the rights and freedoms of an individual, then those listed in the Appendix will be responsible for alerting the ICO of any personal data breach without undue delay, but no later than 72 hours after having become aware of the Company’s personal data breach. Where it is not possible to inform the ICO in this time those listed in the Appendix will be responsible for explaining to the ICO the reasons for the delay. If the personal data breach happens outside the UK then those listed in the Appendix will be responsible for alerting the relevant supervisory authority in the effected jurisdiction. If those listed in the Appendix are not able to provide the ICO/other relevant supervisory authority with all the relevant information related to the personal data breach then those persons shall provide the information in phases without undue further delay. Those listed in the Appendix will be responsible for alerting the relevant data controller as to the personal data breach that has been identified as soon as they are aware of the breach, having particular regard to any contractual obligations the Company has with the data controller. Where a personal data breach has been identified, which results in a high risk to the rights and freedoms of individuals, those listed in the Appendix will be responsible for informing those individuals effected by the personal data breach without undue delay. The Company has implemented appropriate technical and organisational protection measures to use the personal data affected by the breach, in particular to make the personal data unintelligible to any person who is not authorised to access it, such as encryption. It would involve disproportionate effort to tell all affected individuals. Instead, those listed in the Appendix shall, on behalf of the Company, make a public communication or similar measure to tell all affected individuals. 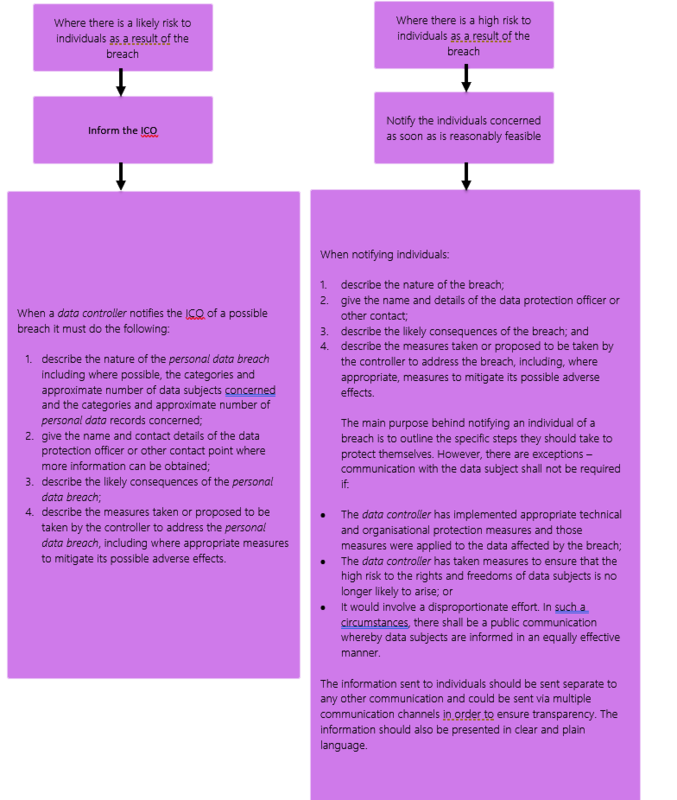 Where possible, a description of the technical and security measures that have been utilised to alleviate data-related risks. Information required for processing sensitive personal data or criminal convictions/offences data. The Company will make these records available to the ICO upon request. Where Company staff receive a complaint from an individual about the use of his or her personal data then they should bring this to the immediate attention of those listed in the Appendix. Processing is necessary for compliance with a legal obligation to which the controller is subject to. Explicit consentof the individual for one or more specified purposes, unless reliance on consent is prohibited by EU or Member State law. Processing is necessary to protect the vital interestsof the individual or another individual where the individual is physically or legally incapable of giving consent. In the course of its legitimate activities, processing is carried out with appropriate safeguards by a foundation, association or any other not-for-profit body, with a political, philosophical, religious or trade union aimand on condition that the processing relates only to members or former members (or those who have regular contact with it in connection with those purposes) and provided there is no disclosure to a third party without the consent of the individual. Processing is necessary for the establishment, exercise or defence of legal claimsor whenever courts are acting in their judicial capacity. Processing is necessary for reasons of substantial public intereston the basis of EU or Member State law which shall be proportionate to the aim pursued, respects the essence of the right to data protection and provide for suitable and specific measures to safeguard the fundamental rights and interests of the individual. Processing is necessary for the purposes of preventative or occupational medicine, for assessing the working capacity of the employee [NOTE 14], medical diagnosis, the provision of health or social care or treatment or the management of health or social care systems and services on the basis of EU or Member State law or a contract with a health professional and subject to the necessary conditions and safeguards. Processing is necessary for archiving purposesin the public interest, scientific or historical research purposes or statistical purposes, which shall be proportionate to the aim pursued, respect the essence of the right to data protection and provide for suitable and specific measures to safeguard fundamental rights and interests of the individual.